Brother is one of the most famous companies in the embroidery machine industry and the PE770 5×7″ is one of their most popular models – it is a full-blown home embroidery machine that comes with a wide variety of features and functions. It features on our list of the best embroidery machines for beginners. Here is our in-depth review. The PE770 is an embroidery-only machine, so if you’re new to the embroidery world be aware that it isn’t suitable for regular sewing. The PE770 utilizes modern technology and combines it with the more traditional features we are already used to. What stands out about the PE770, right off the bat, is the built-in LCD touchscreen. The screen allows you to see the embroidery pattern and makes using the machine fairly easy. You are able to select your stitch, and then see the stitch you’ve chosen. It would be better if the screen was a bit larger, but this size is par for the course and the icons are large enough for those with poor vision. The work area is also brightly lit, which is another great design solution that can especially come in handy when working on darker fabrics. Perhaps one of the highlights of the PE770 is the USB port. Although this is fairly common these days, it’s still great to see that designers pay attention to user satisfaction and ease of use. The USB port allows you to import designs from your USB stick (you can download them from the internet or even design your own on a computer, which can be very rewarding). 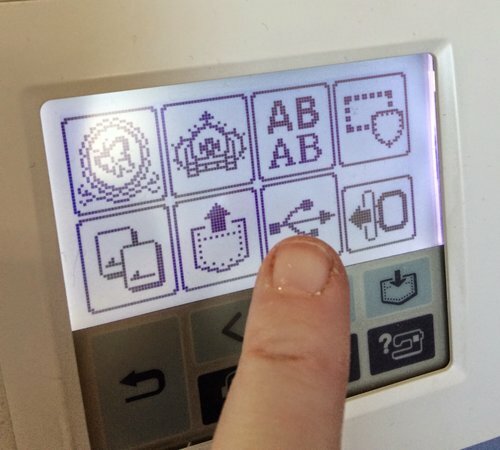 There is also an embroidery card slot, allowing you to use designs from Brother’s range of embroidery cards. Although this is another useful addition, the cards are not included, so you’d have to purchase them separately. You’ve probably already got a USB stick or two (and they’re dirt cheap), so simply downloading designs from the internet or designing your own is much easier and more convenient. With dimensions of 21.2 x 16.9 x 17.3 inches, the PE770 is a fairly large embroidery machine, which means the embroidery area is fairly big too, allowing you to stitch individual designs up to 5×7 inches. Still, considering it is pretty lightweight, the PE770 remains fairly portable, making the machine a perfectly functional model. The protective carrying case is another useful little addition, great for protecting the PE770 from dust and damage, but also perfect for carrying the machine around. 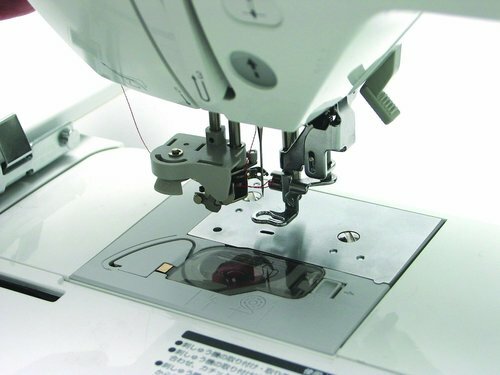 The large selection of 11 sewing feet is another pro, making the device even easier to use. 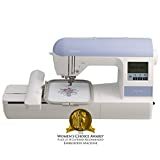 Included are: buttonhole, overcasting, monogramming, zipper, zigzag, blind stitch, button fitting, stitch guide, adjustable zipper/piping, non-stick and open-toe feet. On top of that, included with the product are an embroidery foot, embroidery thread spool, 4 bobbins, a twin needle, needle pack, kneelifter and a storage compartment. And lastly, this is an aesthetically pleasing embroidery machine, featuring modern design and sleek lines. In a word, the design is spot-on, making the PE770 a beautiful, highly functional embroidery machine. Now, let’s talk a bit about performance. Ease of use and functionality is something Brother pays a lot of attention to, and this is mirrored in the performance aspect of the PE770. A large number of automatic features and pre-sets is included, making this embroidery machine perfect for hobbyist and home business owners both. The latter will certainly be impressed with the PE770’s speed – the machine stitches at a speedy 650 stitches per minute. There are 184 built-in sewing stitches, along with 136 built-in embroidery designs. The built-in stitches include a wide variety of different types of stitches such as scallop, smocking, shell tuck and heirloom. Among the 136 built-in embroidery designs are scrollwork, florals and quilt designs, as well as 10 frame shapes with 12 border styles. Of course, you can import as many designs as they like via an USB stick. There are also 6 built-in embroidery lettering fonts, meant to be combined with included or USB-imported designs for truly unique creations. The LCD display is highly intuitive and very easy to use, while the speed control with a start/stop button guarantees top precision. The sideways sewing feature works very well too and it’s perfect for appliqué and cylindrical sewing, since it allows you to sew horizontally. All of this, combined with the large embroidery area, makes the PE770 an amazing embroidery machine, performance-wise. 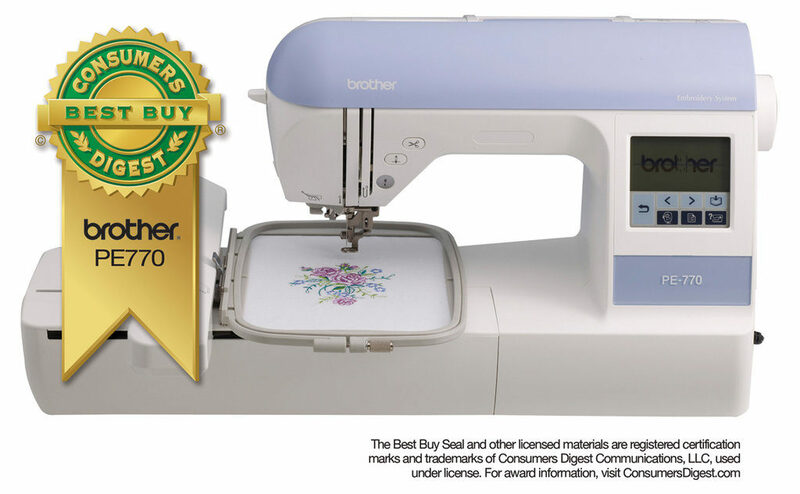 The Brother PE770 is one of the best embroidery machines on the market today. It’s great for hobbyists and professionals both. This is, essentially, what makes it so great and this is why it’s rated so highly and why it is one of the best-selling models Brother have ever produced. The PE770 embroidery machine is a well thought out, well-designed product that performs great and doesn’t cost too much. Great for starting a home-based business and great for letting your creativity flow. Highly recommended.